Both Devices comes with Octa Core processor, 3GB RAM, and Fingerprint Scanner. 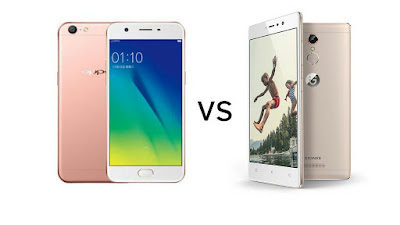 On Display, Oppo A57 has a 5.2-inch (1280 x 720 pixels) HD 2.5D curved glass display whereas Gionee S6s has a 5.5-inch (1920 x 1080 pixels) Full HD 2.5D curved glass display. On Camera both Phones has a 13MP Rear camera, On the front, Oppo A57 has a 16MP front camera whereas Gionee S6s has an 8MP front camera.